The Museum of Contemporary Art Taipei (MoCA Taipei; Chinese: 台北當代藝術館; pinyin: Táiběi Dāngdài Yìshùguǎn) is a museum of contemporary art, located in Datong District, Taipei, Taiwan. It was built during the period of Japanese rule in 1921 as Jan Cheng Elementary School, which now occupies a new structure on the back of the historical building. After WWII, it hosted the Taipei city government and became an important landmark, thanks to its highly recognizable symmetrical building and belltower in historicist style. After the city government had moved to the new location in Xinyi district, it was designated as a historical building, and re-opened in May 2001 as Museum of Contemporary Art, Taipei (MOCA Taipei), as the first museum in Taiwan to be dedicated exclusively to contemporary art. While showcasing mainly contemporary Taiwanese art, under director Shih Jui-jen its activities have become more and more international. In 2009, it organized a solo show of Taiwanese artist Yang Maolin as a pavilion at the Venice Biennale. In 2009 and 2010 it collaborated with MoCA Shanghai, Today Art Museum Beijing and Guangdong Museum of Art in the organization of the Animamix Biennial. 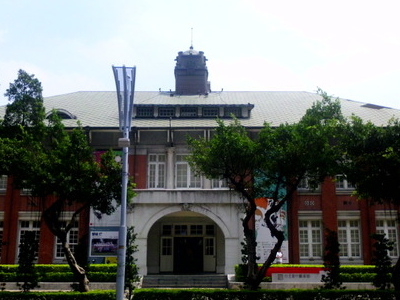 The museum is accessible within walking distance South West from Zhongshan Station of the Taipei Metro.